The Glade Holland Glade which it was referred to is a great development in Rehoboth east of Route 1 Those looking for a single family home in the Rehoboth Beach area can consider the neighborhood of Holland Glade if they would like to be close to the Boardwalk and enjoy some of the most luxurious amenities and attractions around. One of the major advantages of The Glade: Holland Glade in Rehoboth Real Estate is the fact that most of the single family homes that make up this community were custom built This means that real estate in the neighborhood does not exhibit the bland, repetitive nature of many residential communities where all home feature a similar design. 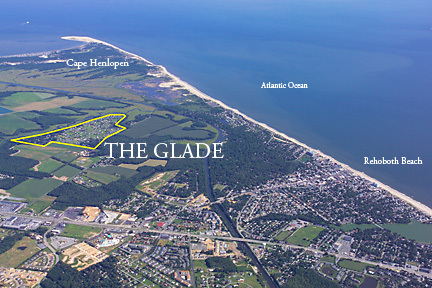 The Glade: Holland Glade in Rehoboth real estate includes only single family homes. Residents of the neighborhood benefit from the fact that Holland Glade is surrounded by state wetlands, which means that the community enjoys a secluded and serene feel. Additionally, the community is ideal for boaters and lovers of water sports thanks to the fact that many of the homes features private docks. From the community, boaters can easily access either Rehoboth Bay or Delaware Bay by water. In addition to private boat docks on some homes, Holland Glade also features community amenities including a large swimming pool, a tennis court, a fitness center, and a racquetball court. Not only do residents of the Glade: Holland Glade in Rehoboth real estate benefit from neighborhood amenities such as those listed above, but they also can take advantage of Rehoboth Beach attractions that draw vacationers from all over the country every summer. With Cape Henlopen, Dewey Beach, and Cape May located nearby, those live at Holland Glade will have many outdoor activities to keep them busy. Public schools located in the area include Cape Henlopen High School, Sussex Central Senior High School, and the G.W. Carver Center. Area private schools include Delmarva Christian High School and Christian Tabernacle Academy. Holland Glade is located in the Cape Henlopen School District. The area’s schools regularly rate highly in comparison with educational institutions in the rest of the country. There are many convenient shopping locations in and around Rehoboth Beach. For everyday purchases such as groceries and pharmacy items, area residents can head to the Giant at Lighthouse Plaza or the Walmart on Rehoboth Mall Boulevard. Otherwise, the Tanger Outlets offer extensive shopping opportunities with many different retailers. The Rehoboth Mall located off of the Coastal Highway is another shopping resource that can be reached within minutes of the Glade: Holland Glade in Rehoboth real estate.